What has become of Noryangjin market? Noryangjin Fisheries Wholesale Market, one of the most iconic markets in Seoul, is turning into a total mess amid a conflict over a relocation plan. Since opening in its current location in 1971, the 66,000-square-meter seafood market ― the city's largest and oldest ― has been operating around the clock and serving 30,000 customers per day, becoming a cultural landmark and tourist spot even for foreign visitors. However, the years-long conflict over the moving plan between the market managing company and fish sellers is feared to hurt merchants' livelihoods and furthermore, the market tradition and identity that have received rave reviews globally. Citing safety problems in the old building, the National Federation of Fisheries Cooperatives, better known as Suhyup, which manages the market, opened a new eight-story building next door in March 2016 that can house nearly 700 fish sellers, after spending $455 million (517 billion won). Suhyup claims the relocation is inevitable, citing the danger of potential accidents from deterioration of the old facility. It launched a government-funded plan in 2004 to overhaul the establishment. "The old facility was built 48 years ago, so we can no longer allow them to do business there," said Ahn Jae-moon, CEO of Suhyup Noryangjin Fisheries Wholesale Market. "As it is in danger of collapse and power outages, its safety is seriously questionable." However, more than 130 vendors are still refusing to move across the street to the new market, claiming that the spaces are unfit to be fish shops and too cramped to run their businesses. "It is unreasonable for Suhyup to force us to move to a new building that is too small to place a refrigerator," a vendor said. "Along with the smaller stall space, the rent is two to three times higher (than that of the old facility)." Another vendor said, "Those who have moved to the new building are struggling to make a living because the rent is higher, but their businesses are not earning enough." Amid stronger resistance, Suhyup also offered 30 billion won in supplementary support for the merchants and said it would seek to resolve the matter through negotiations, but to no avail. Along with those issues, fish sellers claim that Suhyup pushed ahead with the new building project without their consent. However, Suhyup rejects the accusation, saying the two sides had 23 rounds of negotiations. In addition 80.3 percent of vendors agreed to the relocation plan in April 2009. The contract to use the old building by fishmongers expired in 2016, so they have been illegally occupying the facility ― despite 60 sets of talks between the two sides and Suhyup's attempts to impose a court order to forcibly relocate them. As a final resort, Suhyup cut power and water at the old site on Nov. 5, issuing an ultimatum that it would only allow relocation for fish sellers who apply for the move to the new building by Nov. 9. As a result, 127 out of 258 vendors who had remained at the old facility decided to move. Suhyup plans to forcibly evict the remaining 131 ― although it has yet to fix a schedule. "The old building must be demolished, but its size is too massive to do so with ease," Ahn said. "Considering the size of the remaining fishmongers, we plan to decide when and how to destroy it." 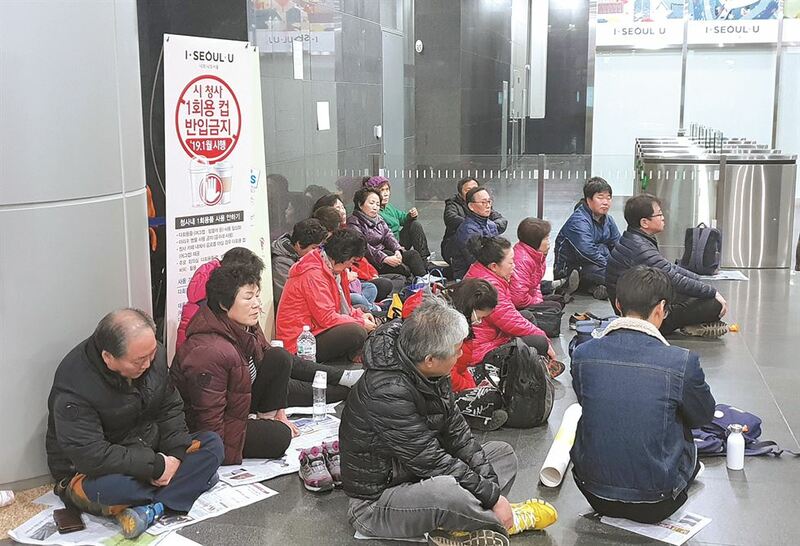 Some of the remaining vendors started a sit-in protest at the lobby of the Seoul City Hall, Monday, demanding the city government take administrative measures to restore the water and electricity. Those opposed to the relocation plan also argue that the modernization project will remove the market's "unique tradition" that helped the place get officially listed as a Seoul Future Heritage in 2013. In that respect, those still protesting want the old building to be renovated instead of being leveled. "While the Noryangjin market is a place for our livelihoods, it is also one of the best tourist destinations in Seoul, serving as a historic market for decades. Why does Suhyup want to destroy the precious heritage for its real estate development plan?" said a member of the alliance of the merchants resisting the move.